Brushing with abrasive toothpaste wears the sensitive areas of your teeth. 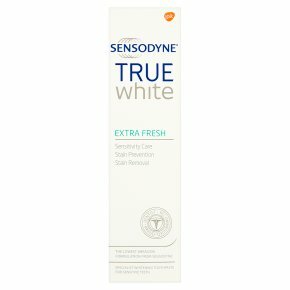 Sensodyne True White has the lowest abrasion formulation ever in a Sensodyne toothpaste. With twice daily brushing it: Provides specialist care for sensitive teeth Helps to restore the true colour of your teeth Leaves a protective shield to help prevent new stains forming Freshens breath, fights cavities and helps keep gums healthy. Always follow the label directions: Brush twice daily and not more than three times. Minimise swallowing and spit out. The ends of the carton have been glued down. Do not use if carton ends are open. WARNINGS AND PRECAUTIONS:<br>Keep out of reach of children. Not for use by children 12 years and under unless on the advice of a dental professional or doctor. Sensitive teeth may indicate an underlying problem which needs prompt care. If symptoms persist or worsen consult your dentist. If irritation occurs, discontinue use.